Max Beckmann’s Hölle der Vögel (Birds’ Hell) (1937-38) achieved a new world record price for the artist of £36,005,000 / $45,834,365 / €40,865,675 in the Impressionist and Modern Art Evening Sale on 27 June. Hölle der Vögel (Birds’ Hell) continues the Germanic tradition of using gruesome allegorical scenes at the same time as taking aspects of Classicism and mythology to turn reality into a timeless evocation of human suffering. In this sense, the painting transcends the time and political situation in which it was created to become a universal symbol of humanity like Pablo Picasso’s Guernicaof the same period. Begun in Amsterdam in 1937 and completed in Paris at the end of 1938, this work ranks amongst the clearest and most important anti-Nazi statements that the artist ever made, mirroring the escalating violence, oppression and terror of the National Socialist regime. 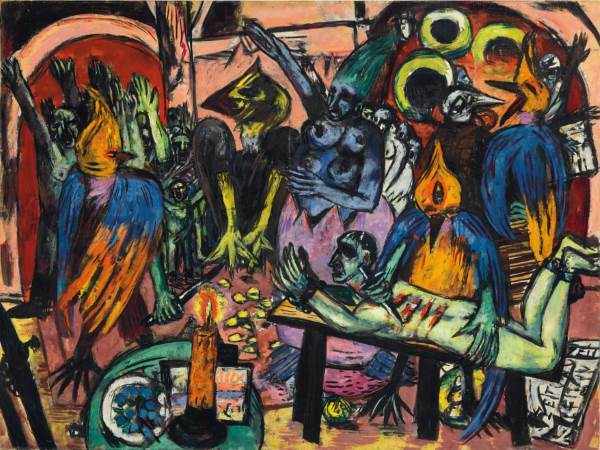 Painted with vigorous, almost gestural brushstrokes and bold, garish colours, Hölle der Vögel (Birds’ Hell) envelops the viewer in a sinister underworld in which monstrous bird-like creatures are engaged in an evil ritual of torture. At the front of the scene, a naked man – the symbol of innocence within this reign of terror – is shackled to a table, held down by another bird that is slashing his back in careful, horizontal lines.